Tomorrow I’m going to be posting about some of the staples I keep in my pantry and how I use them to make quick, easy meals. (In case you haven’t noticed, I’m trying to post more useful things like this in addition to recipes. Have any ideas for a post you’d like to see? Let me know!) But here’s a little spoiler for you: one of those staples that I always have on hand is couscous. 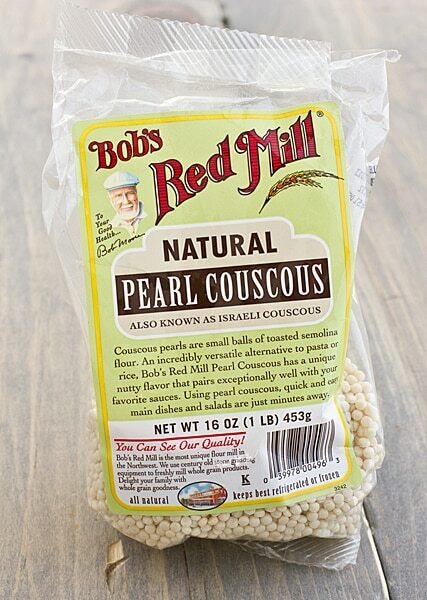 I love regular couscous, but lately I’ve been using more Israeli couscous. It’s larger than traditional couscous and has more of a pasta-like texture to it. You can use it in place of regular couscous (although they’re cooked differently, so be sure to follow the instructions on the package!) and it also makes a good substitute for pasta in a pasta salad (chilled or warm). Last year I posted a recipe for Roasted Cauliflower & Kalamata Olives and I’ve been trying to work it into a pasta salad-like recipe for a few months now. You know how sometimes you make a recipe and it is so close to being good, but there’s always something a little bit off about it? That’s what kept happening with this one. And then summer came and it seemed kind of silly to continue working on a cauliflower recipe, so I set it aside until fall. Now that it’s (sort of almost) fall, I decided to revisit this recipe again and this time I thought I’d use Israeli couscous. Pasta didn’t work and whole-wheat couscous was a disaster, so I was hoping that Israeli couscous would be the solution. And it was! The Israeli couscous doesn’t soak up all of the lemon vinaigrette the way the whole-wheat couscous did (which made the salad way too dry! ), but it soaks up more of it than pasta. The lemony dressing adds a bright note of citrus to the otherwise earthy combination of cauliflower and olives. 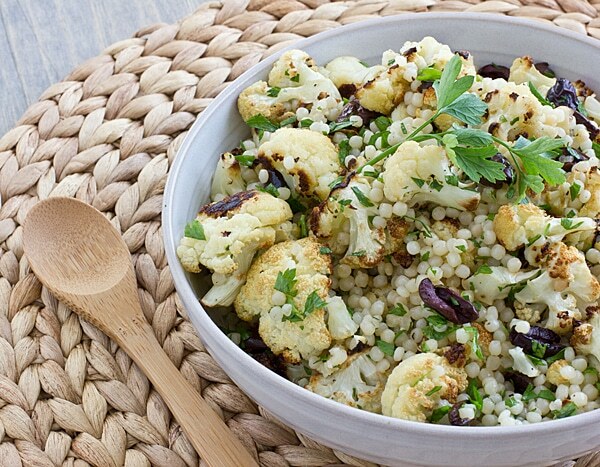 A warm couscous salad made with roasted cauliflower and kalamata olives. Spray rimmed baking sheet with olive oil or cooking spray. Place cauliflower florets on baking sheet; spray with additional cooking spray and sprinkle with salt to taste. Bake for 20 minutes, then stir in kalamata olives. Cook for 15-20 minutes more or until cauliflower is beginning to turn golden brown and olives have started to shrivel. Combine cauliflower and olives, couscous, and parsley in a large bowl. In a small bowl, whisk together olive oil and lemon juice. Pour dressing over salad and stir to coat. Add salt and pepper to taste. Serve warm. I have never thought to combine cauliflower and olives. I can see how roasting it would help the flavors blend really well and the lemon just compliment it all. Yum. I’m going to try this with garlic and swap out the couscous with spaghetti squash. Kiersten, I love cauliflower and couscous but DESPISE olives! Any other suggestions as to what I could add to this salad? Hi Laura! You could use all kinds of things instead of the olives! Some roasted red peppers would be nice, or for a little sweetness maybe try some dried fruit. I think I’ve only tried israeli couscous once and I wasn’t sure what to think about it…I found the texture weird at first but I actually liked the chewiness and it was pretty fun to eat! Plus it looks gorgeous in this salad – I love how you kept the recipe simple with ingredients that would really go well together! It is a little weird–it reminds me of something that I can’t quite put my finger on. Tapioca maybe? But I love it! Yes, it does remind me of tapioca! I’ve only had the smaller couscous, but I want to try the Israeli variety and I like the addition of cauliflower. Bookmarking this one! Ok, now i’m totally craving roasted cauliflower 🙂 I always forget to do cool things with it like add it to couscous (you are so darn smart!). As far as ideas go, I just saw a guide to lettuce in a magazine and that seemed super handy! 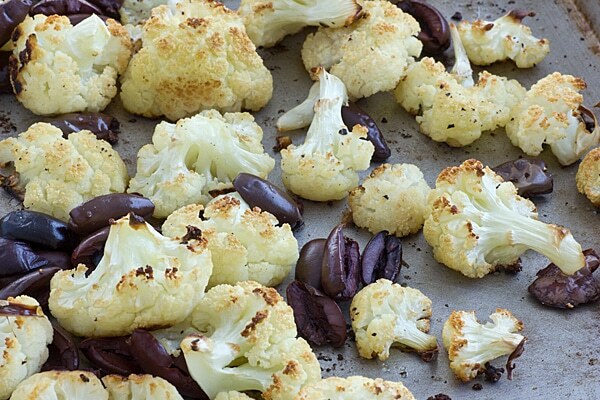 I just love the combination of roasted cauliflower and olives! Your recipes are the BEST thing for my weekly meal planning! Putting these ingredients on the grocery list to make this next week. Thanks! This looks so good. Next month I’ll be transitioning to a yeast free diet for four weeks. I’ll be sure to stop and see what recipes you have that I can try. I like this one but I don’t think I can have citrus while on the diet. making this for dinner right now. smells good!! Have you ever tried this with colored cauliflower? No, I haven’t, but I’m sure it would work just fine! I went through a stage of using Israeli couscous ALL the time but recently haven’t used it at all! Thanks for the reminder to restock and start using it again! Made this tonight and it was Scrummy. Added feta and my little boy (3) said ‘this is so yummy I’m going to eat it all up’. That NEVER happens, so thank you! Well, that is high praise! 😀 Thanks for the feedback! Very unusual combination (for me), but it works so well! I didn’t have couscous on hand, so I used orzo. Loved it! These are great ideas – thanks! Invasive made this a few times with quinoa instead of couscous and its very filling. I also use a lot more lemon juice. So yummy! I’m glad you enjoy the recipe!